Jeevan Ravindran is a passionate human rights activist who also campaigns against poverty, homelessness and other social causes. 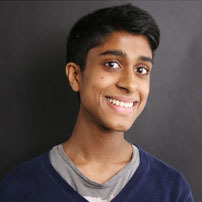 Born in London but also raised in Sri Lanka, Jeevan felt strongly about economic inequality and started working as a volunteer with Oxfam at the age of 14. In the summer of 2014, he travelled to India and worked with HelpAge India and AIM for Seva, compiling case studies of local elders and teaching English to a group of children at the local boys’ home. He continues to travel to India regularly, also volunteering in 2015 and 2016 for different causes, including setting up a website for an orphanage in Chennai. In 2014, he founded the Human Rights Society, a youth activism group, at his school, and worked with charities such as Amnesty International and Women for Women International. Directing human rights theatre, coordinating awareness evenings, creating a human rights journal and holding fundraisers, the group aimed to increase their peers’ knowledge of human rights issues such as LGBT rights and Black Lives Matter. They also conducted an extensive campaign for women’s rights, focusing especially on Afghanistan and El Salvador, and Jeevan spoke at the UPF International Women’s Day Symposium at the House of Commons in both 2015 and 2016. In 2016, the group were also named as one of the top 3 campaigning groups nationally at the Amnesty Youth Awards. Jeevan has also worked with homelessness and disability charities. In 2015 he was also awarded the UPF Youth Achievement Award and the Student of the Year Award. He is a passionate writer, but also enjoys performing in theatre and music. He is currently studying for a degree in French and Spanish, but eventually aspires to be an international journalist focusing on human rights and social causes.